The idea of direct-to-the-brain interfacing is one that’s been around in science fiction since, well, science fiction began. I have a friend who complains, on a regular basis, that she can’t type as fast as she can think, and that she needs a machine that can translate her thoughts directly into words. And viola, I may have found it. 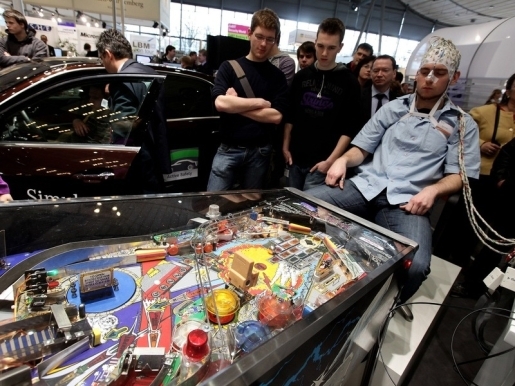 The German company Berlin Brain-Computer Interface has put together a pinball machine that runs via the power of the mind. No touching, just a weird skull cap and some electrodes on the nogging, and you’re Tommy! You know, now that this technology exists, it’s going to complete change things. Can you imagine being able to, say, write blog posts with your brain, the words appearing on screen as you think them? Can you imagine being able to drive just with your brain, or change the channel on the TV just by blinking? There’s no limit to the miracles this might bring about for people with partial or full paralysis, people in comas, and any number of people with physical limitations. Robot arms and legs, full-body Surrogates-style robots, telecommute via brain transmission and robot, the works!